Arvo Pärt's 75th birthday falls next Monday, and it's an event the record companies were hardly likely to overlook. In fact, the relative (and I mean relative) paucity of Pärt recordings over the last year or two suggests they have been saving up some some gems for release on or around the day itself. The Fourth Symphony is the major contribution from ECM towards the celebrations. The recording only dates back 18 months, so perhaps it is unfair to accuse them of sitting on it. 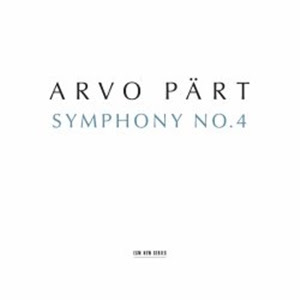 But for Arvo Pärt fans that is probably 18 months too long. They have, after all, been waiting almost 40 years since his last symphonic work, the ground breaking 3rd, a turning point on his path towards the 'tintinnabulatory' style. The new symphony is only really unusual in Pärt's recent output for being a orchestral rather than vocal. But vocal music forms the basis of everything that happens in it. The work was commissioned jointly by the LA Philharmonic and the Canberra Festival, and it was the 'Angeles' in Los Angeles that provided the composer's inspiration. I say inspiration, perhaps I mean excuse, to recycle an older work, the 'Canon of the Guardian Angel' from his liturgical choral cycle 'Kanon pokajanen'. But then, radical innovation, let alone continual originality, is hardly the aim of the religious minimalism project. The predominant texture is pianissimo strings chords playing out slowly in strict homophonic sequences. As such, the work, and especially the first movement is reminiscent of the orchestral versions of 'Summa' and 'Fratres', which will no doubt please the many fans of those works. My only concern is the extent to which the work justifies its title of Symphony. Pärt is clearly very relaxed about the issue, perhaps it was merely a condition of the commission that he didn't feel like making too much of a fuss about. Contrast, such as it is, comes through the relationship between the movements rather than within them, and there is never any development in the traditional sense – how could there be in aesthetic as austere as this? In the third and final movement, the texture diversities slightly, and I mean slightly. The lower strings move to long pedals, the phrases in the violins are more clearly emphasised through varied dynamics, and a range of percussion is introduced. Curiously, the music of the closing minutes sounds very similar to Mahler, to the Adagietto of his 5th Symphony or the last movement of his 9th. That comparison alone suggests music that is more symphonic, if only by extension. The work is well played by the LA Phil under their then Artistic Director Esa-Pekka Salonen. To my mind, the conductors real strengths lie in guiding more complex music than this, but his ability to control minute details while never loosing sight of the bigger picture is as valuable here as anywhere. The work is taxing on the string section, all those tutti, pianissimo, high textures give the violins nowhere to hide. In general they do well, but the very end of the work is a bit messy. I suspect that the composer's idea here was that the music would simply evaporate, getting higher and higher as it dims al neinte. That isn't quite what happens, but I'm more included to blame the overambitious score than the technique of the players. The disc ends with an extract from the 'Kanon pokajanen', the movement from it upon which the symphony is based. It is a valuable addition in terms of setting the context for the symphony, although the shift from orchestral to unaccompanied choral is a bit abrupt. Pärt devotees may also feel short changed, in that not only is this excerpt taken from a previous ECM recording, that they probably already own, but even when its 15 minute duration is included, the disc's running time barely tops 50 minutes. But then, what is the alternative? Commission another work to pad out the programme. I imagine ECM would rather save up that sort of project for the composer's 80th.